Well, the model score today has finally improved…to -81. This means that the market has finally improved with price. As we warned, large up moves are likely to move the score initially very little. What will move the score and eventually give a BUY signal is sideways spread action which allows the moving averages to catch up and eventually a breath thrust that will take spread prices through them. That is probably still weeks away. 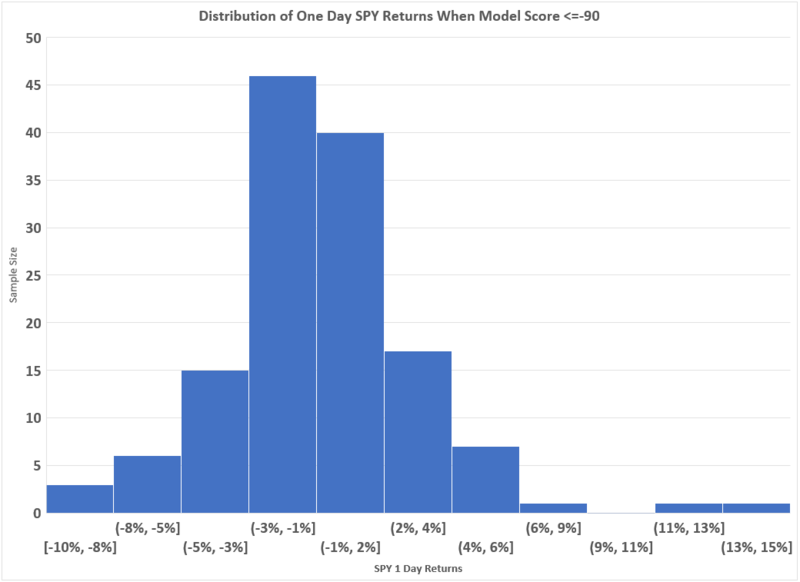 For your information, the Histogram below shows the distribution of returns that can be expected (and also which explains today’s ~5% SPY return) when the model has a score of -90 or lower. What we can see is that not only is volatility elevated, but there is a long right tail. 5 sigma events tend to happen when the market is that oversold and are to be expected. Better timing opportunities and/or prices certainly lie ahead.